Enjoy the atmosphere of a fully glazed extension – while relaxing in an orangery-styled room that feels like a continuation of your home – when you choose the Ultrasky Roof from Novaseal. Contact our team today for details and prices. Let in more light with the Ultrasky Roof, which works in an unconventional way by extending to the eaves instead of using a flat roof system. It features fewer bars than other roof systems available on the market to deliver fully-illuminated environments that feel spacious and connected to the outside. The ridges and bars used in the Ultrasky Roof are incredibly strong and have been designed to support larger panes of glass. Its appearance is further enhanced by the absence of bulky radius ends that create improved sightlines. Better views come as standard with this incredible entry from Ultraframe. Make the most of the space you have available by including a structural goalpost in your orangery or extension design. The spanning capability of the Ultrasky roof is extensive but can be further improved to allow bi-fold or patio doors up to 6.5m to be installed by using the goalpost enhancement. Light will enter your orangery or extension from above and through your doors, creating a room that is connected to the outside. Even when the bi-fold or sliding patio doors are closed, the garden will remain in clear view and remain. Ask about the structural goalpost when contacting us. Learn more about our Ultraframe range by reading our brochure. 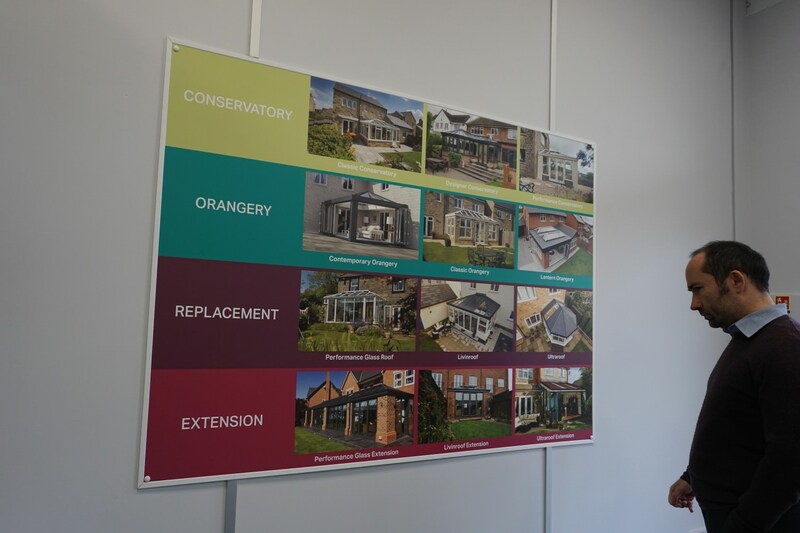 Discover inspiring ideas for your orangery or extension project and call the Novaseal team for guidance and prices. We can advise on all aspects of your product – including choosing the right colours, hardware, accessories and glazing. Complement the design of your Ultrasky Roof with bi-fold or patio doors, which we can provide as part of your design. Novaseal will support you throughout, making the entire process easier and stress-free. With two decades of experience in the industry, we’ll be able to help you every step of the way. The Ultrasky Roof offers incredible protection from the weather. It has been designed to withstand wind speeds of up to 130mph and uses a range of technological features to guarantee long-term performance and durability, resulting in a conservatory roof that is watertight. 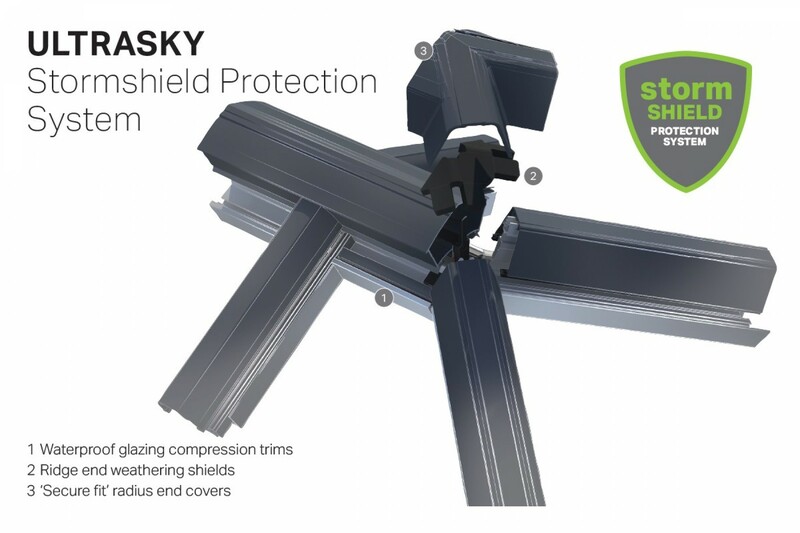 The Stormshield included as part of the Ultrasky roof uses waterproof glazing compression trims, weathering shields that sit at the end of its ridges and covers that safely secure at the roof’s radius ends. The result is a durable construction that’s a long-term investment. Homeowners are keen to find a conservatory roof that will keep their new room warm so that they can use it as a functional space all year long and enjoy other important benefits – like reduced heating bills and a lower carbon footprint. 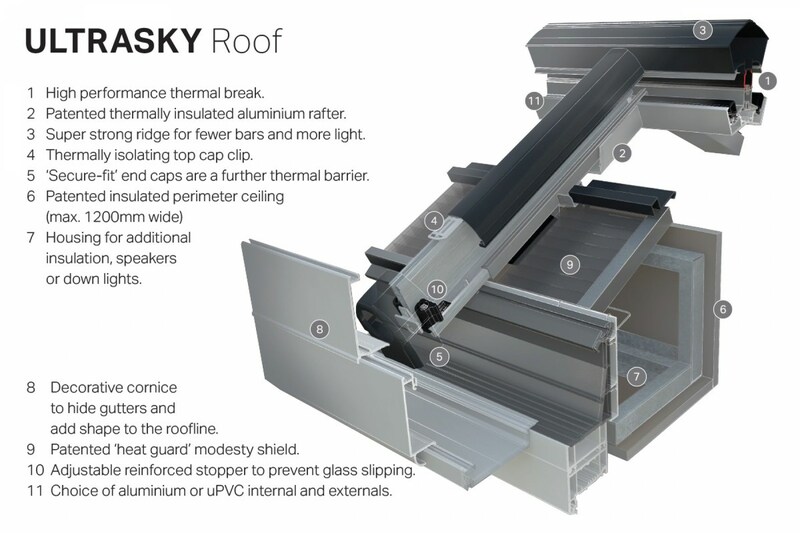 The Ultrasky Roof incorporates a high-performance thermal break and insulated aluminium rafter. These features work in line with other innovative technology in the roof to retain heat and produce a lower U-value while reducing costs. Homeowners and installers alike will be attracted to the many market-leading features that come as standard with the Ultrasky Roof. Learn more about the benefits of this superb conservatory roof system and the upgrades available for your orangery or extension. The Ultrasky Roof is the perfect choice for homeowners who want to build a conservatory or extension that will function as a dining area, living space – or any other room that suits the needs of their project. The pelmet is infilled with mineral wool insulation. Lighting and speakers can be installed into the structure to create an authentic ‘room like’ feel that looks and behaves like a natural extension of the home. Homeowners will have the option to choose super-insulated columns as part of their orangery or extension design. The thermal capacity of these columns surpasses that of a brick column of the same size five times. Super-insulated columns are internally plastered and will work with the insulated perimeter pelmet to deliver a comfortable room space. Flat or fluted designs are available, and the columns can sit on top of a dwarf wall. Renovate the outside of the Ultrasky Roof with a decorative cornice that will hide the guttering and create improved sightlines. Flat or curved designs are available in different sizes, and customers can choose any colour they like to personalise their installation. Call Novaseal today on 01329 233500 for more information about the Ultrasky Roof or send us a short message using our contact form to request a callback. Visit our online design tool to generate a free conservatory roof quote or get prices for doors, windows and much more.